A4 Size 7.3 x 8.0 in. (186 x 205 mm) 8.3 x 11.7 in. A4 Mounted 7.3 x 8.0 in. (186 x 205 mm) 11 x 14 in. A3 Size 10.7 x 11.8 in. (272 x 300 mm) 11.7 x 16.5 in. LARGE 16 x 17.7 in. (407 x 448 mm) 21.25 x 24 in. THANGKA 17.5 x 19.6 in. (445 x 498 mm) 18.5 x 20.6 in. 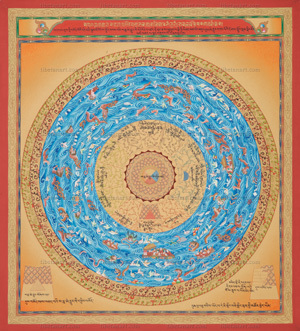 NOTE: A similar unbrocaded thangka of this 'Element Mandala from the Kalachakra Tantra' by Sunlal is now available for sale. Priced at GBP £1,100.00. "This mandala is based upon the Shri Kalachakra Tantra, and shows the discs of earth, water, fire and wind, and their measurement in leagues (Skt. yojana) according to the explanation given in 'The Ornament of Elegant Sayings', which are The Ornaments of the Wise Man's Throat: The Garland of Fire and Wind: The Heart-Jewel of Analytics." Occupying the central area of the mandala is the golden-yellow earth disc, which is divided into an inner and an outer half. At the centre of the inner half is the circular plan of Mount Meru, with its four faces appearing as quadrants that are coloured: sapphire-blue in the south (right); ruby-red in the west (bottom); golden-yellow in the north (left), and crystal-white in the east (top). The circular disc of Mt Meru is embellished with twelve concentric golden rings, which represent the 'wind-tracks' of the sun's orbit through the twelve zodiac houses during each year. Outside the lotus-petal ring that circles the base of Mt Meru are three concentric rings decorated with buildings and foliage, a ring of water and rocks, an outer ring of buildings and foliage, and finally a dark area with a ring of clouds. These represent the eighteen alternating rings of the six inner continents, the six seas, and the six mountain ranges that collectively occupy the inner half of the earth disc's surface. The seventh continent, known as Greater Jambhudvipa, occupies the outer half of the golden earth disc's perimeter. This outer ring is divided into twelve radial and cloud-like segments, which are known as the twelve sectors or outer continents. These twelve outer continents are divided into groups of three, with each main or cardinal continent being flanked by two sub-continents, and with each group of three continents having a specific colour and shape. The main continent of our world system is known as Lesser Jambhudvipa, which lies to the south of Mt Meru (bottom). It is red in colour and triangular or axe-like in shape, representing the shape of the Indian sub-continent. The other three main continents are: square and golden-yellow in the west; white and circular in the north; and blue and semi-circular in the east. The area that these four main continents and eight sub-continents occupy is known as the Great Golden Ground, with each of the twelve continents being surrounded by its own salt-water ocean. The Tibetan names of the continents are inscribed upon each of their radial sectors. Only the individual shapes of the red southern and blue eastern continents are shown in this painting. Extending outwards from the perimeter of the earth disc to an equal width is the seventh sea, which is known as the 'Great Salt Ocean'. Many different kinds of beings are depicted amidst the turbulent blue waves of this great salt ocean, such as geese, ducks, fishes, sea-serpents, sea-dragons and sea-monsters, water deer and horses, turtles, otters, naga-serpents, makaras and garudas. Jewels and lotuses emerge from the water, and four groups of human beings are shown floating perilously upon four rafts, two of which have small pavilions on their decks. The perimeter of this Great Salt Ocean is encircled by a seventh ring of mountains, known as the Fire or Vajra Mountain, which is created from the subtle particles that rise up from the outer disc of the fire element. This Vajra Mountain ring is represented by thirty-two banks of golden flames that circle in a clockwise direction against a black background. Finally, outside of the Vajra Mountain ring is a blazing circle of fire known as the 'Wild Mare's Face' (Skt. vadavamukha), which is created from the subtle particles that rise up from the outer disc of the wind element. "Earth, water, fire and wind, the seven golden mountains and Mount Meru, which, so it is said, make up the land mass. As for the twelve partitions or outer sections, they represent the four continents and the eight sub-continents." The combined inscription along the bottom of the painting is part of an invocation that describes the body and speech of the Buddha as Shri Kalachakra.